Speed 600 images/min subject to viewing area. 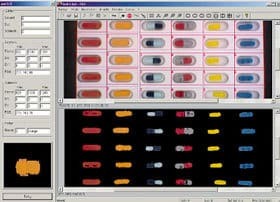 Our German built optical tablet control modules are highly reliable in checking the colour of tablets, dragees and capsules. Fragment detection, contour and spot detection are also embedded into the inspection system. The inspection system consists of a colour camera, an industry-standard PC with colour monitor and lighting devices as well as powerful software. The modules can be operated easily with comprehensive and video-assisted help support. Ability to "teach" the software for particular blister shapes and colours. Automatic search and find function for all products and colours within blisters. All parameters for a specific format are stored in the PC. Size and colour tolerance can be adjusted manually, adapting to the customers requirements. No unwanted glare when illuminating the product or foil. Detailed evaluation, organised and arranged results display, easy to operate under Windows interface. Entries are made by using the mouse and the on-screen keyboard. No need for an external keyboard. Heat management by heat sink, no fans or ventilators!